Expandable, washable, and ecologically correct – the perfect beach/tote/shopping bag. Made with crochet cotton with size G (4 mm) hook. I recently came across a suggestion that makes a lot of sense. When doing color knitting, managing as few as 2 different skeins of yarn gets to be a real pain. Bobbins help a lot, and the easiest bobbin tip I’ve found is free. Just save some of those little plastic closure thingies that come on bread bags. These little clips also work as markers when doing pattern work. Why didn’t I think of that? Earlier this year, several yarn companies added a new product to the knitting market, sock blanks. The ones I’ve seen in my LYSs have been on the expensive side. This weekend, one of the contributors on the ezine CraftStylish posted an article on making sock blanks of your own, by using food dyes on wool sleeves, taken from sweaters that you want to recycle. Nifty, thrifty, and green (in more ways than one)! What a terrific idea for recycling old T shirts! And, it couldn’t be easier! You cut giant loops from the shirt, join them into a long length of “yarn” (talk about bulky! 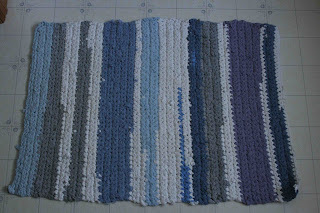 ), and crochet them into a cool rag rug! If you don’t have a T shirt you’re willing to cut up, drop by your local thrift shop and pick up a few. Brilliant! 1) I know what crochet is, but what does “hyperbolic” mean? I’ll tell you. I don’t know. It has something to do with geometry and space. For the purposes of this article, that’s all I need to know. 2) Why crochet a coral reef? This is an easy question. The Institute For Figuring is an educational organization dedicated to enhancing the public understanding of figures and figuring techniques. From the physics of snowflakes and the hyperbolic geometry of sea slugs, to the mathematics of paper folding and graphical models of the human mind, the Institute takes as its purview a complex ecology of figuring. These scientists and mathematicians recognized that the forms of the organisms that make up a coral reef are hyperbolic in structure. They also recognize the ecological hazards that are killing the reefs. 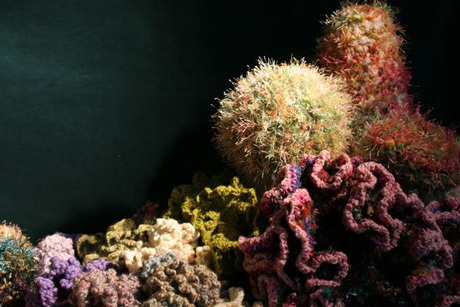 A small scale project, to crochet a reef of wool to pay homage and draw attention to the plight of the corals and other reef creatures, has blossomed into a worldwide movement. 3) The crocheted reef, at the beginning of March, covers more than 3000 square feet. It is now a traveling exhibit, and everywhere it goes on display, local crocheters are invited to attend workshops where they can make and contribute their own hyperbolic creations. The reef will visit New York City in April. 4) I’m seriously thinking of going. Visit the site of the Institute for Figuring for more information on hyperbolic figures and their applications, and on the Coral Reef project. 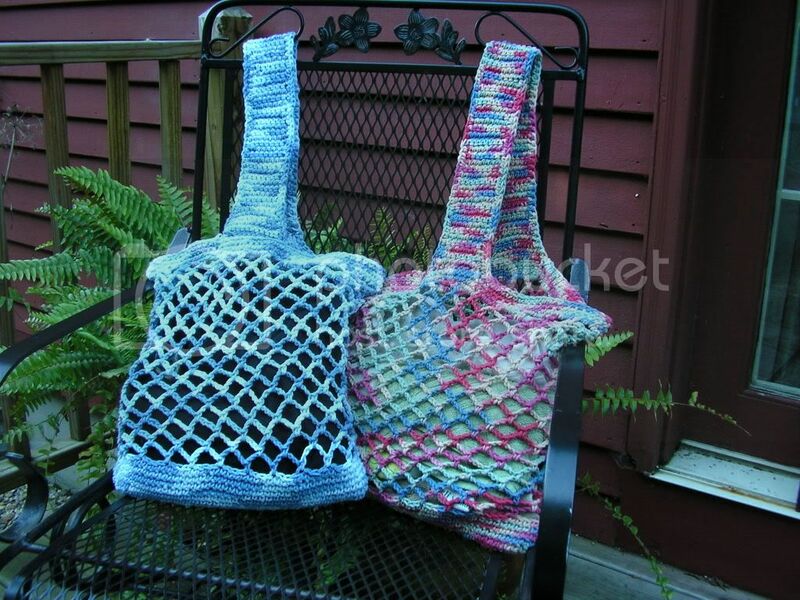 We’ve been taking our own bags to the grocery store for several years now, and I’m trying to remember to bring one of these colorful crochet totes whenever I go shopping at other stores as well. This is a quick, easy pattern, and using different multicolor yarns, the variety can be endless. These easy to carry bags make great gifts too. Cotton yarns work best. Click on photo for larger view.